The Aqua-Vu Micro Stealth 4.3 Underwater Viewing System brings an amazingly economical system with full-blown features at a fraction of the price. You'll get live, color, underwater video on a 4.3" LCD with RCA video out. 95% of the fishing experience takes place underwater. - See how fish are reacting to your bait/lure, what kind of fish are in that area, what the structure looks like, where fish are hiding in that structure, and more! Trending at $123.32eBay determines this price through a machine learned model of the product's sale prices within the last 90 days. 3 different keel weights included. Can be used with surface fishing, float fishing, or trolling. Shock resistant. Super anti-wobbling retrieve. 3 different patents. AQUA-VU UNDERWATER VIEWING Camera System. Condition is Used. Shipped with USPS Priority Mail. Only used a few times. May need new battery. aqua vu underwater fishing camera. Condition is Used. Got in a boat I just got. No interest in older underwater cameras. GoFish Cam – Features & Benefits. GoFish Cam – Technical Specs. GoFish Cam – In short So that you can see how the fish are reacting to your baits or lures, or even striking them. Moreover, the GoFish Cam is designed to not affect your lure or bait’s presentation. We check every item to the best of our ability! Brand New Never Used NEW Marcum RC5 Recon 5 Underwater Camera Viewing System. Shipped with USPS Priority Mail. From health and fitness, to outdoor recreation, we strive to develop products that will enrich your life, make you safer, and more productive. CATCHES THE ACTION, AS YOU CATCH YOUR FISH. Waterproof: Up to 65 ft.
Trending at $44.54eBay determines this price through a machine learned model of the product's sale prices within the last 90 days. Resolution: 1000TVL. Depth: 50m. Application field: monitoring aquaculture, underwater exploration, Ocean/Ice/Lake fishing swimming/diving/snorkeling are all avialable. 1x 7" TFT Monitor. With 12 highlight night-vision lights,which can fill the light well. The Live Strike™ System allows you to watch trolled or drifted lures and fish following and striking on the Aqua-Vu monitor, LIVE as it happens. Shallow diving crankbaits, spinners and live bait rigs, swimbaits and other soft plastics work great. Spydro, aims to change that. It can be cast & retrieved, trolled, or still-fished on the surface or the bottom. Spydro is compact and can be fished from shore, from a boat, or through the ice. The information is automatically synced as soon as Spydro is on the water’s surface and connects through iOS & Android App. Attach it to your fishing line and and cast out, or use a bait-boat. Waterproof 50m waterproof IPX8. Lens fixed focus f=3.0 F/NO=2.0. Standard accessories AV Cable, USB Cable,User Manual. Vintage Canon AS-6 Underwater Film Camera With Bag & Manual Very Nice!! 【10M WiFi Synchronization】It is easy to synchronize the cam with your phone via the wifi and APP. Output: HDMI HD output USB:USB2.0. LENS:170 degree A high resolution wide Angle lens. 【2 Batteries】2 batteries,prolonged battery life and stronger power. It was sent in has been professionally inspected by Marcum and operates perfectly (see inspection sheet in photos). Can easily be fixed if you have a small screwdriver or send back in to Marcum, it is still under warranty. From the Website Don't leave your success on the lake up to chance. get to know the spot you're fishing with help from the Nature Vision® Aqua-Vu Explorer 7. It's a complete black and white monitoring system for outstanding price. The Aqua-Vu Micro Plus works great for ice fishing, on the boat, or off the dock and can also be used for a variety of above water uses like looking into tight spaces! Sharing your underwater video is now possible with video out capability! Underwater camera. Condition is Used. Charged and hold a charge, usb cord included. No sd chip included. Works great. Excellent condition. Tested and is fully functional. Distressed box. Used for trolling, casting, float or bottom rig carp fishing. This underwater viewing system is previously owned and fully inspected and works well. There are only light surface marks on the body from light use. 90 degree field of view with color kill. What is the history of the item?. This MarCum Mission SD is previously owned and in excellent working condition. There is little to no wear throughout from light use. There is a plastic cover on the screen still intact. Up for sale is this MarCum VS825SD Underwater Viewing System. An item that has been used previously. eb a y Hours of Operation. No EXCEPTIONS. NO EXCEPTIONS. No Exceptions. 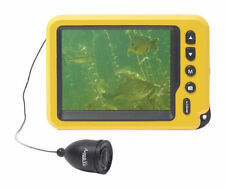 The Recon 5 has cutting edge Marcum technology in a compact, pocket-sized underwater viewing system. Monitor features switchable color and B/W LCD video out. WARNING WARNING:� This product can expose you to chemicals including TDI, which are known to the state of California to cause cancer and birth defects or other reproductive harm. Discover the freedom that only Marcum's modern technology can bring you. Recon 5 Underwater Viewing System, MARCUM TECHNOLOGY IN A COMPACT, POCKET-SIZED UNDERWATER VIEWING SYSTEM. 5" flat panel, high-resolution color LCD monitor displays in a 16:9 aspect ratio. Recon 5's on-screen display (OSD) shows battery status. Includes 50' of cable. MICRO AV II. COMPLETE HANDHELD. as they Best Describe the Item. Auto light-sensing infrared lighting system. Color display. PICTURE OF THE ACTUAL ITEM! International orders. Outdoors Insight AVMicro stealth 4.3 Underwater Camera System. Shipped with USPS Priority Mail. Water Wolf HD. Used for trolling, casting, float or bottom rig carp fishing. 16GB micro SD card (NOT INCLUDED) is in use. Tackle Haven INC. 10 Piece Kit. 120 degrees x 90 degrees Wide Angle. INCLUDES: 10 pcs kit for multiple filming options. 5" 15M 8GB Underwater Fishing Camera. 800x480 High Resolution Screen: Eyoyo New underwater fishing camera with a 5" HD screen, 800x480 super high resolution brings you a more realistic underwater world, you can observe the underwater topographic more cleraer, also can check the fish whether has bite the hooks. what's more, equipped temperature, depth, direction and electricity display function, more convenience. DVR Video Recording & Photographing: This 5" underwater camera fish finder support take photo and video recording when you see a excited landscape in the seabed, also, you can recording you wonderful moment of fishing to share with your family and friends. Simply connect the GoFish Cam to your fishing line. GoFish Cam works perfectly for all the fishing styles. GoFish Cam captures all the underwater action. Cast perfectly with GoFish Cam's small size. Item is used and overall in great condition, everything that is pictured will be included. It has been powered on (when applicable) and function tested and inspected to the best of our abilities. CONDITION: Preowned/used- item is in overall good condition. Resolution: 1000TVL. What s more important this ", underwater monitor system also has the DVR and photo function. DVR function. Application field: monitoring aquaculture, underwater exploration, Ocean/Ice/Lake fishing are all swimming/diving/snorkeling available. Check out our videos. Cast perfectly with GoFish Cam's small size. At 4.5" ( 11.5cm) long and pre-weighted to 3.3 oz (( 94g) (no added weights necessary), it's perfect for small mouth bass, pike, and even larger saltwater fish. ). Use the VS485C in full-color mode to see the underwater world the way nature intended. Color Kill Technology allows you to switch over to black-and-white mode for an amazingly crisp and clear image. Duration of battery use: : about 8 hours. Size: 89mm 38.5mm/3.5 1.51. HERE WE HAVE A CABELAS ADVANCED ANGLERS UNDERWATER VIEWING SYSTEM. IT FEATURES A 5.5" B & W MONITOR FOR ENHANCED VIEWING. THESE UNITS WILL PROVIDE THE SUPERIOR PERFORMANCE YOU'RE LOOKING FOR AT A PRICE THAT CAN'T BE BEAT. Put the whole underwater world in the palm of your hand. 241680-1 60 10122018 04112019. SEE PICTURES FOR BETTER IDEA ON CONDITION. SYSTEM IS USED BUT IN NICE SHAPE.